Three-fourths of the way through this first ODI, the match seemed to be over as a contest. But just when the spectators at Hambantota might have resigned themselves to watch the game drag itself to a stultifying finish, Pakistan staged one of those incredible revivals that sprinkle 50-over cricket with a dash of magic. The protagonists in this drama were Sohaib Maqsood and Fawad Alam, who added 147 runs for the sixth wicket, in 117 balls, to bring Pakistan back from the dead and drag them over the line with one ball left to play, after all manner of final-over drama. It was only the second time in the last three years that Pakistan had successfully chased a 250-plus target. 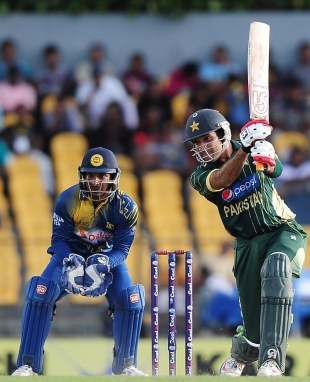 In a match shortened to 45 overs a side following a shower that began six overs into the game and lasted just under an hour, Sri Lanka had set Pakistan 275 to win. They had recovered from 75 from 4 in the 18th over, thanks to Angelo Mathews, who made his highest ODI score and put on 116 for the fifth wicket with Mahela Jayawardene, and thanks to an unbeaten 15-ball 39 from Ashan Priyanjan, who had thrown Pakistan's pace bowlers off their line with his movement around the crease. Having sent Sri Lanka in and had them in trouble, with his trio of left-arm seamers exploiting the bounce and overcast conditions, Misbah-ul-Haq had seen the game slip alarmingly from Pakistan's grasp. His own tactics had played some part in this momentum shift - he brought spin on from both ends and spread his fields almost as soon as the Jayawardene-Mathews partnership had begun - and Sri Lanka had taken full toll, scoring 60 runs from their last five overs and 105 from the last 10. Halfway through the chase, Pakistan had lost even more momentum and were sinking without a trace. Mohammad Hafeez, Younis Khan and Umar Akmal had perished trying to boost a sluggish scoring rate, and Ahmed Shehzad, who had looked good without quite getting beyond third gear, got a good ball from Thisara Perera, which nipped in off the track and bowled him through the gate. When Misbah-ul-Haq gloved an attempted sweep to the keeper, at the exact halfway point of the allotted 45 overs, Pakistan needed 169 runs at 7.5 an over. Maqsood scored at a run a ball right from the time he walked in, but Fawad at the other end was struggling. The required rate was creeping up towards nine an over when Maqsood ran down the pitch to the first ball of the 33rd over, and was beaten by extravagant turn from Rangana Herath. So was Kumar Sangakkara behind the stumps, however, and Maqsood had a life and Pakistan four byes. Having let Maqsood off, Sri Lanka's worries grew as he began finding the boundary roughly once an over. He punched a waist-high full-toss from Thisara Perera between the bowler and mid-off, sliced a length ball from Herath deliberately through the vacant slip area, and whipped a low Malinga full-toss - in the first over of the batting Powerplay - into the narrow gap between midwicket and deep square leg. Fawad, who till then had looked to bring Maqsood on strike whenever possible, then struck two fours off one Kulasekara over. With three field-restricted overs still remaining, Pakistan now needed 72 from 48. Maqsood and Fawad, already sprinting frantically between the wickets, upped their game: in the next over from Malinga, they ran three doubles in four balls. Nineteen came off the next two overs, and Pakistan now needed 45 from 30: Pakistan were in routine Twenty20 territory. All they needed was that one big over, and it came off a bowler who had tormented them during the Test series. The two batsmen at the crease hadn't been around for Herath to inflict any psychological damage on them, though, and all they saw were the gaps in the field. Fawad drilled Herath through cover, Maqsood swept him square, Fawad swept him fine. Fourteen came off that over, and Pakistan were coasting. This being Pakistan, though, a bit of late drama was in order. Shahid Afridi provided it, predictably enough, after Fawad fell to a slower ball from Malinga. Afridi walked in with 22 required from 18, and he and Maqsood brought it down without too many alarms to five from the last over. Having given away singles off the first two balls, Kulasekara bowled a dot ball to Afridi. Three from three. Afridi swung at the next ball, a short one, and missed. Maqsood hared out of his crease, trying to steal the strike. Afridi sent him back. Sangakkara underarmed a throw to the bowler. Maqsood was miles out. Kulasekara was at handshaking distance from the stumps. The ball slipped from his grasp and missed the stumps. Kulasekara sent down the fifth ball. It was short and wide, and Afridi smacked it past point for four. Pakistan had lost this match more than once, but they had won when it counted.